First of all, I would like to congratulate the China-Britain Business Council and welcome the publication of "China in Britain" during Prime Minister David Cameron's visit to China. 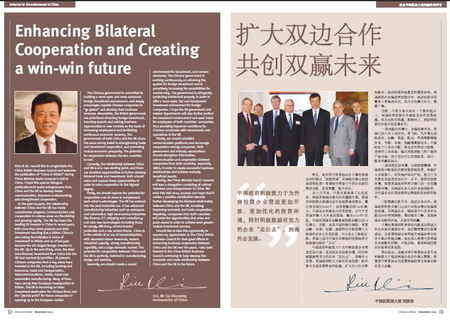 I hope this special bilingual publication will assist entrepreneurs from China and the UK to develop better communication, improved understanding, and strengthened cooperation. 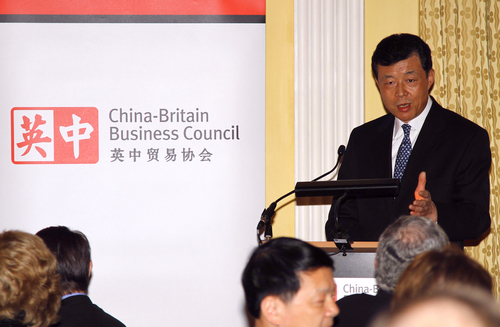 In the past 10 years, the relationship between China and the UK has made considerable progress. Communication and cooperation in various areas are flourishing and growing rapidly. The UK has been the leading EU investor in China in recent years, with more than 6000 projects and total investment reaching $16.4 billion. China is also taking the initiative in terms of investment in Britain and as of last year became the 6th largest foreign investor in the UK. Up to the end of July 2010, the total (non-finance) investment from China into the UK had reached $730million. At present, Chinese companies from 6 key areas have invested in the UK, including banking and insurance, trade and transportation, telecommunications, media, travel and automotive manufacturing. Many of them have set up their European headquarters in Britain. The UK is becoming an ideal investment destination for Chinese firms and the "pivotal point" for these companies in opening up to the European market. The Chinese government is committed to building a more open and more advanced foreign investment environment, and deeply encourages capable Chinese companies to "go global" and develop their business overseas. Meanwhile, the British government has prioritised attracting foreign investment, boosting exports and seizing business opportunities in new markets as the basis of increasing employment and facilitating continuous economic recovery. The governments of both China and the UK share the same strong belief in strengthening trade and investment cooperation, and promoting mutual economic prosperity. The potential for cooperation between the two countries is vast. Currently, the relationship between China and UK is at a new starting point, and there are excellent opportunities to further develop bilateral trade and investment. Both should seize and capture these opportunities in order to raise cooperation to the highest degree. Firstly, we should explore the potential for cooperation and do more to complement each other's advantages. The UK has entered into the post-industrial era. It has advanced manufacturing industries such as aerospace and automotive; high level service industries like finance, ICT, shipping and consultancy; and also new technologies including those for energy efficiency, environmental protection and a low carbon future. China is in the middle of an era of industrialisation, with abundant labour resources, mature industrial capacity, strong manufacturing capability and a large domestic market. The potential for cooperation between China and the UK is perfectly matched in manufacturing, design and services. Secondly, we should create a sound environment for investment, and remove obstacles. The Chinese government is working continuously on reforming the system for foreign investment and is proactively increasing the possibilities for market entry. The government is stringently protecting intellectual property in order to offer a more open, fair and transparent investment environment for foreign companies. I hope the UK government and related departments will also further perfect the investment environment and ease travel for employees of both countries' companies, thus providing improved conditions for Chinese companies with investments and operations in the UK. Thirdly, we should establish communication platforms and encourage cooperation among companies. Both government and industry associations should strengthen information, communication and cooperation between companies from both countries, especially SMEs, in order to create successful business relationships and achieve mutually beneficial results. Shortly, the Prime Minister David Cameron will lead a delegation consisting of cabinet members and entrepreneurs to China. We wish this visit every success and hope that it makes a positive contribution towards further developing the bilateral relationship between China and the UK, including improving economic and trade cooperation. Hopefully, companies from both countries will seize the opportunities that arise and push ahead in order to achieve even greater mutual investment success. I would like to take this opportunity to express my appreciation to the China-Britain Business Council for their great efforts in enhancing business cooperation between China and the UK over the years. I also look forward to the China-Britain Business Council continuing to help develop the economic and trade relationship between China and the UK in the future.